As one of the largest retailers in the UK, B&Q is the kind of place that pretty much sells everything. Bedroom cabinets, showers, units, tools and even the kitchen sink, can be purchased at B&Q. As well as all of this though, B&Q do have a section in most of their stores dedicated to sheds, greenhouses, workshops and other garden structures. Their website also has a vast amount of garden structures to tempt you with as well. The idea of this, is to give you fine folks all the right information when it comes to getting the best deal possible when shopping at B&Q. We are not going to promise you a whole bunch of B&Q voucher codes that will end up not saving you a penny. We have two purposes with this guide. The first is to inform you of ways that you can actually make sure you are getting the best deal from B&Q. We will tell you where to look in order to find those sweet B&Q deals. The second purpose we have, is to help you avoid all these money saving sites that promise you the best B&Q discount codes, deals, once in a lifetime offers and other too good to be true promises. We know that if you have come to this page you are looking for a discount code for B&Q, as we explain further up B&Q dont often issue discount code. As such we thought you might like to see what are some of the best discounts that are currently on offer from other garden building retailers. The 6 tips that 90% of people who SAVE money at B&Q use! As B&Q sell so many different items, it can be hard sometimes to find a deal that is for what you want. Well, we have taken that into account here and have dug deep and searched high and wide to make sure we are giving you B&Q deals that are not only genuine, but are also easy to use and will not cause you any headaches at all. Below we have proven ways that you can make your money go further when you are shopping at B&Q. 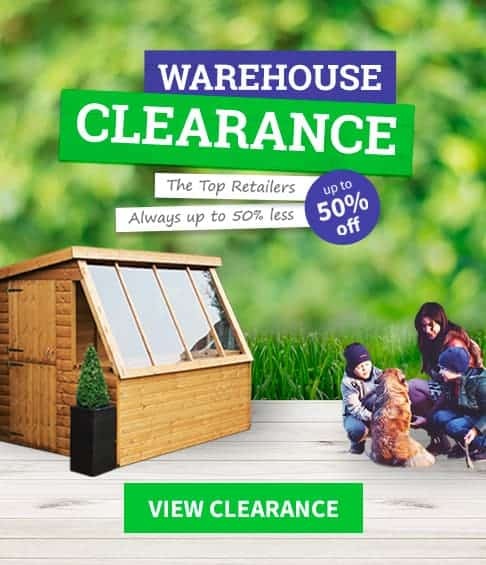 B&Q always have a shed, summerhouse or other garden structure on offer: Call it a flash sale, weekly, or daily offer, but there is always some kind of offer going on here. Most of the time an offer will only be around for a day or two and then be replaced with another one, so this is always a good place to start your search for a good deal at B&Q. The most recent offer that they had here was for a 6 X 4 wooden apex shed that they were selling for the very reasonable price of £169 – a very nice deal. While this offer may not be running at the time you read this, we can assure you that this is the kind of deals that they have here most of the time. One thing that is interesting about this section of the site, is that while at first glance it looks like there is only one item in the B&Q sale, actually when you look down just a little bit, you can see that they usually have a couple other items for sale as well. These sometimes can be a shed, summerhouse or another type of structure, but quite often these can be accessories for your garden like tools or a lawn mower. Twitter is a great place to keep an eye on the latest, B&Q deals: Okay, so we will admit that you will have to do a little bit of scrolling to find the deals that are on offer here, but if there is a B&Q voucher code floating around in the wild that is actually going to save you some money, then it will be posted on their official Twitter page. One of the things that is useful about their Twitter page, is that sometimes B&Q will run a fantastic sale on a shed for example, but this offer will only last for a short time. By looking at their Twitter feed, you are always going to find the latest B&Q deals here first. Again, we must say that you will have to do a little digging on their Twitter page to find these great deals, but they are there to be had. B&Q have a number of different payment options for you to consider: We have all looked at that huge summerhouse, pictured ourselves drinking a nice glass of wine and watching the world go by while inside it. But then we look at the price tag and we are back to reality, drinking a can of Special Brew under an umbrella in the back yard. But that does not have to be the case, as B&Q are one of the very best retailers when it comes to making the more expensive items seem affordable. They offer a number of different ways for you to spread the cost and actually make getting that dream summerhouse, workshop or even large playhouse for the kids a reality. You can buy now and pay 12 months later, and take advantage of their interest free credit if you can pay off what it is you buy in a few months. They also have an option where you can pay fixed monthly payments in order to pay something off. So if there is a larger and more expensive structure that you are interested in, do not right away think you cannot afford it or run to the store to buy a bunch of Lotto scratch cards. Have a look at their payment options to see if there is a way you can turn your dream garden hideaway a reality. Their Diamond Club offers great discounts for over 60’s: B&Q have some great membership offers, but one of the very best is their Diamond Club for people who are over 60. Now this is not a club that is going to throw a whole bunch of B&Q voucher codes your way. What it does do though, is give you some very impressive discounts. The main reason people love this, is that on a Wednesday you get 10% off. As of writing, the Diamond Club is said to undergo some changes that are going to offer even more offers and discounts, but their 10% off on Wednesday is said to be staying. The B&Q Facebook page will always have the latest deals: Much like their Twitter page, the B&Q Facebook page is a great place to have a look to see what the latest deals are. While we have seen offers for things like sheds and playhouses on here, as B&Q offer such a vast amount of products, you are not always going to get items for your garden listed here. Still if there is some kind of B&Q discount code or a deal happening, then it will be posted here. They also have some competitions here as well, where you can win things like paint, a lawnmower and even gift cards, and all you have to do is like the page to stand a chance. So while like their Twitter page you will have to search a little for the deals, if there is a B&Q deal happening it will be posted here. Join the B&Q club to get some great deals: This offer here is very similar to the B&Q Diamond Club, except this one here will allow anyone to join as there is no age limit. You get some exclusive deals and discounts, but one of the best things about signing up for this is the £5 offer. We know that £5 off a £50 purchase may not sound like the biggest discount in the world, but that £5 is a lot better in your pocket than B&Q’s till. A round-up of all the current B&Q voucher codes we found online. As one of the biggest garden retailers in the UK, B&Q are one of the top retailers you will see on these money saving sites offering you magical B&Q voucher codes and coupons that claim will save you a fortune. Most of the time at best, you are just going to be linked to the B&Q website and if you are real lucky they might even link you to a specific page. Most of the time these amazing offers that these types of sites offer do nothing more than waste your time. Well that is what we are looking at here. We are taking a close look at the main sites who claim to offer amazing B&Q deals, but who ultimately end up wasting your time. Using Google, we have used the most popular search terms for people who are looking to save money when purchasing items from B&Q. The search terms that we used to bring up these sites were: B&Q Voucher Codes, B&Q Coupon code, B&Q Current Discounts, B&Q Current Voucher Codes and B&Q Sale. Old Codes & Deals Do Not Work! One of the biggest problems that we have with many of these sites, is that they use B&Q voucher codes that are long expired. Most sites keep these around as a way to make their selection look larger than it is. Plus they are sure to tempt the odd person with one of their old codes. Please do not bother trying old codes and deals. You will just waste your time and get very frustrated in the process, plus you will not actually save any money! What they claim? On this site they claim that if you use their B&Q deals, you will be able to save some money and finally get all that DIY work done. One thing that we did notice was that they do say that their B&Q voucher codes, deals and offers are from 2016, so at least they appear to be trying to be as current as possible. What We Found? There are actually quite a lot of deals on this page and when you click on them, you will be taken to the relevant page. But the problem we have with this site, is that none of the offers relate to garden structures at all. It is like they have ignored this part of B&Q all together. Even when you scroll down to the part when they inform you about past B&Q deals that they have had, we could not find any that were for sheds or anything like that. What they claim? VoucherCodes.co.uk specifically call their section B&Q voucher codes 2016 and they even go as far to say that their deals are for whatever month it is. They have a large selection of deals that cover pretty much everything B&Q sell. They also have links to sites other than B&Q and say that they might interest you. What We Found? While they do have deals for pretty much every department in B&Q, we did see that they had the current deal for lawnmowers that B&Q have. This is in the B&Q garden section, so at least they are keeping an eye on their garden deals. What we do not like, is how they try to get you to look at their deals for other retailers and they even have some expired B&Q voucher codes as well. In all, there is just too much to look through here, especially when you consider it will really not save you any more money than if you were to just go to B&Q directly. What they claim? Once you have read their description about what it is B&Q offer, you then get to the section where they have their B&Q deals. They actually go to the effort to say that these are current B&Q voucher and discount codes and that they are for 2016. So you would think that this would mean that at the very least their first few deals would be the most recent ones that are available everywhere, but that is not the case here at all. What We Found? We found so many expired codes here that we kept looking through them kind of mind blown that there were so many! They have six pages of B&Q voucher codes and other deals on this site. On the first page alone, out of all the deals that they have listed only one, yes that is right, is actually valid and even then it is just a link to one of the memberships offered by B&Q. This site may very well win the award for most expired codes and old deals we have ever seen. While it may be a little on the tempting side to search through all six pages looking for that ultimate B&Q special offer, we cannot stress enough how much of a colossal waste of your time this would be. What they claim? ReVouchers claim to have B&Q voucher codes for the current month that you are looking at their site. They clearly are trying to make their site as straightforward to use as possible and it is not as busy or as in your face as some of the other money saving sites that we have come across. What We Found? They do not have a whole lot of B&Q deals on here, but most of the ones that they have do seem to be the current ones you can get direct from B&Q. One weird thing is that they list the same deal twice, but have it worded in a different way. We clicked on all the deals that they have and every one just took us to the B&Q homepage and not to the deal they are talking about. When you go back to the site, it says if you did not get the deal you were looking for to click again. We did and again it just took us to the homepage! Could this be a sneaky way of getting more people to click one their links? Also, they have an expired codes section under their current deals, which is always something that irritates us as it just wastes people’s time. What they claim? Groupon is actually one of the very first sites that pops up when you search for B&Q voucher codes. Which is very surprising, as B&Q seems to be a retailer that they do not really pay a lot of attention to. They do have a B&Q discount codes section, but it is very bare bones and does not really make any kind of attempt to wow you into checking out their deals. What We Found? Not a whole lot to be honest with you. They only have three current B&Q deals listed on here and even those are just for things that you get from the B&Q homepage. They have one expired deal as well on here, which if that is all they have, makes us think that B&Q is not a site that Groupon regularly keep an eye on. What they claim? MoneySavingExpert.com is by far the hardest site for us to talk about on this list. Not because they are just god awful, but because they really do not have a lot going on. They do have a section called ‘B&Q deals’, but there you will not actually find a whole lot of deals, codes or promo offers. What We Found? This site does actually have some useful information. For example, they have this great little section about how B&Q offer free kids’ DIY classes, which is nice. But when it comes to actual B&Q voucher codes and special offers, there is just not enough here to make it worth your while checking out. If you want to get money off a shed, or make sure you are getting the best deal on a summerhouse, then this site is not going to give you that kind of deal. Their expired codes and deals section is also a little too large for our liking and actually it has more offers in it than their current deals section. What they claim? This is a site that does actually have a B&Q promotional codes section and they do have a lot of information about B&Q. As a matter of fact, we are sure that some people may even be a little on the impressed side when they first look at the site. What We Found? No real deals to be had here. They just give you some general information about B&Q deliveries, their membership clubs and other information that is easy to find on the B&Q website. By far the worst thing about this site, is the way that they try to get you to look at discount codes and coupons for other sites. This section has far more links than it should. What makes it even worse, is that most of these other deals have nothing to do with sheds or any other kind of thing that would go in a garden. This is a site that really is not worth your time at all. What they claim? VoucherSlug.co.uk make some pretty bold claims on their site. First of all, they do have a B&Q voucher codes section, but they go to the trouble of saying that this is updated daily and that they have the latest codes listed on here. What We Found? Okay, so while none of their current deals relate to sheds or other garden structures, the ones that they have in their current deals section are at least valid which is nice, but it means you are not going to be getting any savings on summerhouses or anything else for the garden. One thing that we really hate about this site, is their expired codes section. Many sites will have expired codes and old deals, but we really find it a little dishonest how VoucherSlug go out of their way to say that some of these old B&Q deals might still work. Checking out these old deals will not save you any money. All it will do is waste your time and most likely make you a little annoyed as well. What they claim? They claim that they update their B&Q deals hourly and that they are all 100 percent verified. We have seen a few sites that make the claim to update their B&Q section on a daily basis, but this is the only one that claims to do it on an hourly basis. What We Found? We found a lot of links to the B&Q homepage, that is for sure. We did find some deals on here that are actually valid, and although these were not for garden structures it at least showed they do try to keep up to date with what deals B&Q have going on. We wish that they would actually link to the deals though, instead of just the B&Q homepage. They also have old codes and promos which they say might still work. As you probably know by now, here at WhatShed, we really hate when sites try to get people to click on old deals as it just gets their hopes up that they will save a little money. Really all that will happen is you will look at the old B&Q deal and not find it anywhere on the site. What they claim? MillionPromo.com do not actually make any boastful claims about the B&Q voucher codes and deals that they have listed on their site. They have a pretty straightforward and easy to use site and they do make it a point to have the supposed expiration dates of their deals listed underneath them, so they are trying to be up to date. What We Found? We found that this site did have a couple of B&Q voucher codes, but mostly they were just telling you about various things that are for sale at B&Q. Some of these are actually deals that are going on right now at B&Q, but they did not have a single one for a garden structure. Many of their deals just take you to the B&Q homepage which you could do without coming here first. You are not getting any B&Q deals here that you cannot find easily yourself on the B&Q homepage.